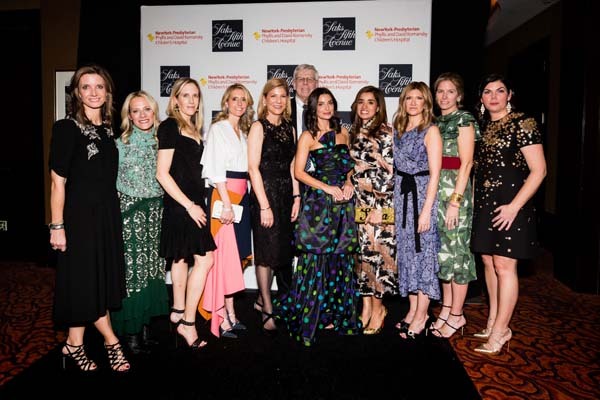 NEW YORK (February 10, 2018) – NewYork-Presbyterian Komansky Children’s Hospital raised $1.8 million at the eighth annual Plates for Pediatrics benefit. A collaboration with luxury retailer, Saks Fifth Avenue, the benefit drew over 500 attendees to the Mandarin Oriental New York on February 1. The benefit was co-hosted by Dr. Laura L. Forese, executive vice president and chief operating officer of NewYork-Presbyterian and Dr. Gerald M. Loughlin, pediatrician-in-chief at NewYork-Presbyterian Komansky Children's Hospital, along with the Pediatric Support Committee and the Children’s Advisory Council. The event raised funds for several hospital-based pediatric programs including: Child Life Services, a program that alleviates children’s fears surrounding the hospital experience by offering activities geared to the social, emotional and educational needs of young patients and their families; The Pediatric Simulation Center, an invaluable teaching resource in medical education that reduces medical errors, creates a culture of patient safety and improves patient care and the care of newborns; Clinical Genetics Services, providing evaluation, diagnosis, treatment and counseling for patients and families who have or are at risk for genetic conditions; and Residency Education, a three-year pediatric residency program designed to provide a supportive and educationally rich environment through which residents can develop into outstanding general pediatricians and pediatric subspecialists. Guests included: Travis Acquavella, Allison Aston, Claire Capello, Arielle Charnas, Natasha de Mallmann, Candice Miller, Jennifer Oken, Marcie Pantzer and Erica Samuels. Stephanie Landess served as the evening’s auctioneer.